At the time I first realized I might be fictional, my weekdays were spent at a publicly funded institution on the north side of Indianapolis called White River High School, where I was required to eat lunch at a particular time—between 12:37 p.m. and 1:14 p.m.—by forces so much larger than myself that I couldn't even begin to identify them. If those forces had given me a different lunch period, or if the tablemates who helped author my fate had chosen a different topic of conversation that September day, I would've met a different end—or at least a different middle. But I was -beginning to learn that your life is a story told about you, not one that you tell. Across the table from me, Mychal Turner was scribbling in a yellow-paper notebook. Our lunch table was like a long-running play on Broadway: The cast changed over the years, but the roles never did. Mychal was The Artsy One. He was talking with Daisy Ramirez, who'd played the role of my Best and Most Fearless Friend since elementary school, but I couldn't follow their conversation over the noise of all the others. What was my part in this play? The Sidekick. I was Daisy's Friend, or Ms. Holmes's Daughter. I was somebody's something. I felt my stomach begin to work on the sandwich, and even over everybody's talking, I could hear it digesting, all the bacteria chewing the slime of peanut butter—the students inside of me eating at my internal cafeteria. A shiver convulsed through me. "Didn't you go to camp with him?" Daisy asked me. "Aren't you listening?" Daisy asked. I am listening, I thought, to the cacophony of my digestive tract. Of course I'd long known that I was playing host to a massive collection of parasitic organisms, but I didn't much like being reminded of it. By cell count, humans are approximately 50 percent microbial, meaning that about half of the cells that make you up are not yours at all. There are something like a thousand times more microbes living in my particular biome than there are human beings on earth, and it often seems like I can feel them living and breeding and dying in and on me. I wiped my sweaty palms on my jeans and tried to control my breathing. Admittedly, I have some anxiety problems, but I would argue it isn't irrational to be concerned about the fact that you are a skin-encased bacterial colony. Mychal said, "His dad was about to be arrested for bribery or something, but the night before the raid he disappeared. There's a hundred-thousand-dollar reward out for him." Like many of Green's characters, Aza Holmes is whip smart, articulate, and tortured by worry. When she was eight, her father succumbed to a heart attack while mowing the lawn. Now 16, Aza takes meds (irregularly) to treat anxiety, which is manifesting in increasingly self-destructive ways. Her problems amplify when she reconnects with Davis, a boy she met years earlier at "Sad Camp," where both had gone to grieve their recently deceased parents. Now Davis's billionaire father is missing, running from a warrant for his arrest. Aza's best friend Daisy, in a classic sidekick role, pressures Aza to contact Davis, hoping they'll learn something about the disappearance—and maybe get a cut of the $100,000 reward. The reunion leads to romance, until Aza's anxiety won't allow it. 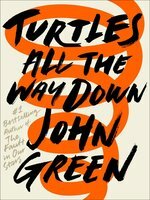 Green's first novel since The Fault in Our Stars is another heartbreaker, full of intelligent questions. It's also a very writerly book, as Aza frames a lot of the questions she asks herself in literary terms. Am I a fiction? Who is in charge of my story? Why do we describe pain with the language of metaphor? Because of this, it's tempting to conflate Aza the character with her author, who has been open about his own mental illness. But readers need not know where the line is between the two to feel for someone trapped in an irrational, fear-driven spiral. In an age where troubling events happen almost weekly, this deeply empathetic novel about learning to live with demons and love one's imperfect self is timely and important. Ages 14–up. Agent: Jodi Reamer, Writers House.